The AMU Faculty of English (Wydział Anglistyki, WA) is the largest centre of English studies not only in Poland but also in Europe. It has a long history, rich experience in didactics, and numerous research achievements both in Poland and abroad. Moreover, WA offers two post-graduate programmes: Postgraduate EFL Teacher Training Studies and Postgraduate Studies in Community Interpreting. There are approximately 1,500 (full-time and part-time) B.A. and M.A. students and about 100 Ph.D. students currently studying at the Faculty. The teaching programme offered by WA is versatile and very attractive. It includes linguistics, literature, methodology of TEFL and other specialist courses (for example, information technology and voice coaching) as well as courses in English as a Foreign Language (EFL) and other foreign language courses (Dutch, Afrikaans, German, French, Spanish, Welsh, Irish, as well as Frisian, Icelandic and Old Germanic languages). Students participating in the EFL courses are to develop a near-native language competence on all structural and functional levels, including pronunciation, vocabulary, grammar and pragmatics. The graduates of the AMU Faculty of English are much appreciated on the labour market, especially for their excellent pronunciation. WA focuses on this aspect of linguistic competence much more than other Polish and European university departments of English. The AMU Faculty of English employs excellent teachers of English, including fifteen native speakers of English, as well as Welsh, Irish, Dutch and Afrikaans lecturers. WA cooperates with 18 European universities in the Erasmus programme. The best students can apply for scholarships at universities in the following European centres: Aveiro (Portugal), Bielefeld, Bamberg, Manheim and Munich (Germany), Helsinki (Finland), Kristiansand and Tromsø (Norway), Trieste (Italy), Vigo and Murcia (Spain), Vienna and Klagenfurt (Austria), Paris (France), Bacau (Romania), and Limerick (Ireland). Additionally, there is an exchange programme for academic staff with Leeds and Colchester (UK). The list of exchange partners grows steadily. The AMU WA book collection is part of the Novum Library. It is the largest collection of English language publications in Poland, including approximately 100,000 books and 80 scholarly journals. It also boasts a large number of specialist dictionaries (including valuable Old English dictionaries), encyclopaedias and other reference publications. Moreover, the Library has manuscripts, microfilms and electronic publications (CD-ROMs) such as linguistic corpora and archives. The Novum Library is an open-access facility. The library also offers students a computer room (15 workstations, including one for visually impaired students) and a study area with ample work space. The electronic catalogue is available here. WA students have access to a well-equipped Internet and multimedia suite. Employees of the WA Centre for Educational Technologies and Language Processing are experts in the area of IT applications in language studies (e.g. analysis of linguistic databases, computer-assisted foreign language teaching, etc.). The WAMU Moodle platform is used to support both full-time and part-time courses with elements of e-learning. The School has training labs for teaching pronunciation and simultaneous interpreting. The ICT Centre provides access to Faculty's audio-visual resources and equipment, such as CD players, portable TVs, DVD players, laptops, multimedia projectors, and over 700 videos holding British and American feature films. The audio resources comprise more than 700 items featuring a variety of EFL materials. The most popular pronunciation courses are archived in mp3 format. The Centre also authors educational materials based on the latest technologies. The WA English Philology Circle is a forum for academic debate, where students are encouraged to develop their research interests already during their undergraduate years. The Circle consists of reading groups devoted to phonetics and phonology, syntax, psycho- and neuro-linguistics, lexicography, the history of English, British literature in English, American literature and translation studies. Recently, an American Studies Student Academic Circle has been founded, which groups students whose interests go beyond literature, into popular culture, politics and history. The AMU Faculty of English employs experts in various fields of language studies, literature and culture. Its list of departments reflects the wide scope of research projects undertaken by the Faculty staff and the wide range of courses and seminars taught. Research conducted at WA is of the highest international quality, as evidenced by the publications of WA staff in renowned journals and publishing houses, the organisation of and participation in international conferences, the scholarships and numerous awards and distinctions granted to WA members, their membership in professional societies and the recognition of Poznań as an internationally acknowledged centre of English studies. WA has a good reputation and high prestige both within and outside of Poland. Literature in English Symposium (LIES) (since 2005). Werkwinkel. Journal of Low Countries and South African Studies (since 2006). ... and a series called Filologia angielska (published by Wydawnictwo Poznańskie; 11 volumes so far). The Faculty has its own publishing section which coordinates these and other publishing projects, and maintains an on-line archive of WA publications. The AMU WA lexicographic team has compiled several dictionaries, notably the two-volume New English-Polish and Polish-English Kosciuszko Foundation Dictionary (2003), currently the largest English-Polish, Polish-English dictionary, and the Longman «Współczesny» English-Polish, Polish-English Dictionary (2004). The second edition of the two-volume Collins English-Polish, Polish-English Dictionary was published in 2006. In 2005, on the initiative of WA, an Interdisciplinary Center for Speech and Language Processing was established at AMU in collaboration with foreign research institutions. Its mission is to create a platform for interdisciplinary research projects carried out by scientists from various fields (such as computer science, linguistics, psychology, pedagogy, medicine). WA students acquire an excellent command of a language that is currently considered a lingua franca, a language that is a reliable tool and a prerequisite for further professional development. Graduates of the AMU Faculty of English are much sought after by employers as they are both well educated in their languages of study and prove themselves to be highly skilled in their chosen professional careers. Our alumni are proud of their Faculty and much praised by their employers and associates throughout their professional lives. The AMU Faculty of English has, for the second time, been awarded the label of quality by the Academic Accreditation Committee. 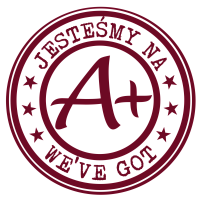 AMU's Faculty of English - which continues the traditions and legacy of the AMU School of English as the largest centre of English studies in Poland and all Europe - has recently been evaluated as outstanding by the decision of the Polish Accreditation Committee (7 November 2013). Queries may be sent to anglistyka@wa.amu.edu.pl.